A place for your business to thrive. Washakie County is centrally located to the sights and cities of the region. 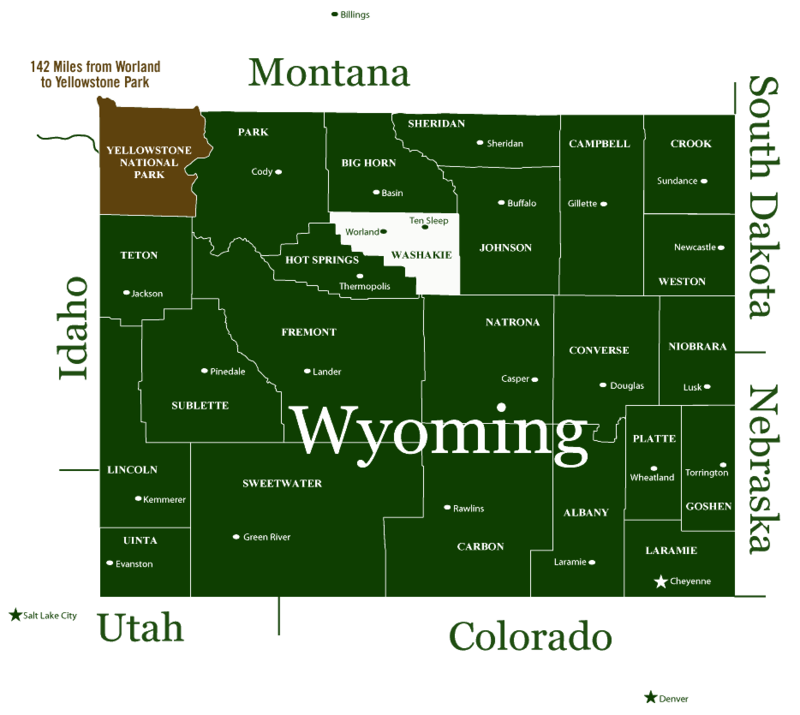 Washakie County is located in the Big Horn Basin in northwest Wyoming. Washakie County is on the western edge of the southern Big Horn Mountains and east of Yellowstone National Park. U.S. 16 and U.S. 20 intersect in downtown Worland. U.S. 16 intersects with I-25 and I-90 on the east side of the Big Horn Mountains, about 60 miles east of Ten Sleep. Yellowstone National Park, Billings, MT, and Casper, WY, are all within a three-hour drive of Worland. Closer by are the Thermopolis Hot Springs, Old Trail Town in Cody, Bighorn Canyon National Recreation Area outside of Lovell, and the wonders of the Big Horn Mountains. Washakie County, by the numbers. 51% of the population is currently male and 49% is female. Washakie County – Some of the lowest tax rates in the country. With the extroadinary tax benefits listed below, Washakie County is business-friendly and ready for growth. Exemptions for farm equipment from sales tax. This business friendly tax structure in Wyoming helps businesses succeed by offering some of the lowest tax rates in the nation. In addition to favorable incorporation laws, a business license isn’t required. With a history of economic diversity, Washakie County provides a fairly stable inventory of existing commercial properties. There are multiple unimproved lots in the industrial district –– perfect for building and in close proximity to the railroad. From time to time, private developers create small subdivisions in the city limits of Worland and often build structures that would work for most any service or manufacturing company. Business-ready lots are available just west of Worland in the newly-created Fair View Industrial Park. This is one of the newest industrial parks in Wyoming. Worland’s downtown has a variety of buildings for sale and also leasing opportunities for retail and office space. Although small, Ten Sleep has commercial properties available as well. Washakie County has one of the most well-educated, and hard working workforces in Wyoming. Approximately 25% of Washakie County residents have some sort ofcollege degree according to Nielsen. Given its central location in the Big Horn Basin, Washakie County offers access to the employment opportunities in Hot Springs County and the southern Big Horn County. This equates to approximately 10,000 workers all within an easy 40-minute drive to downtown Worland. The Washakie Development Association will work with companies considering business relocation or business expansion in Washakie County and determine the availability of workers with a specific skill set. We offer many resources to new and existing businesses to promote our county’s economic growth. Our job training initiative has helped many local businesses get to where they need to be. To encourage new and existing businesses to relocate to the area, WDA offers various incentive packages. Find out more about our business incentives. Whatever your business solutions may be, Washakie Development Association is here to make things easier for you. From developing incentive packages to analyzing business opportunities, we’ll help find a comprehensive solution so you can have the best plan for your business.